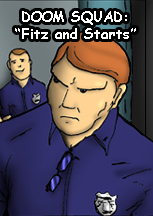 Of all the powers in the universe, Sergeant Jack Fitz has the power to create bubbles. Though the other sergeants look down on his "gift," Jack finds his power extremely useful to his work. When one mouthy sergeant pushes Jack's buttons, he learns firsthand just how useful. Following the events of "Pride's Fall," Slade Dagan sits bruised and bloodied. Gunn and Mindfield discuss Slade's suitability for Doom Squad. Gifted with wealth and super-human abilities, Slade and Madison are on the verge of joining a new government-funded team of heroes... but can a haunting dream help them survive their next mission?